- Fashion Ecstasy on 八月 8, 2018. Game Night was a special event held at the newly opened M’Eat restaurant ( M’Eat Resto Butcher) in the Leslieville area of Toronto. Located at 806 Queen Street East, M’Eat Resto Butcher is a brand new restaurant and butcher shop. It’s an exciting concept combining a restaurant with lunch and dinner services and a butcher shop which operates throughout the day. Co-owner Danielle Brown greeted M’Eat event guests and explained the concept and creation of M’Eat restaurant and butcher. Meat is purchased from Ontario farmers who raise their animals humanely. Danielle explained that they personally go to the farms to see how the animals are raised and to get to know the farmers. They know what the animals eat, where they graze and how they are ethically raised. “Game” is farmed. Wild Game can not be sold; it has to be cultivated. Chef Nelson provides customers with not only healthy meat, but also an ethical meal. The acronym Chef Nelson uses when considering farms is “H.A.W.P.” which stands for hormone-free, animals per acre, winter feed and pasture raised. Chef Nelson ensures that every bit of the animal is used. In his cooking preparation, Chef Nelson uses fresh, organic dairy, seasonal vegetables and humanely raised meats. Upon entering M’Eat, one saw a display case filled with fresh meat. One-sixth of a beef carcass was in the display case along with venison, pheasant, and bison. They always have beef and duck; venison, water buffalo, and bison are displayed at different rotating times. The newly renovated restaurant was created by executive chef and owner Cam Nelson…. Wooden planks and brick walls create an atmosphere of warmth and natural setting. The event took us on an adventure in meat….. It was a treat for meat lovers, for meat connoisseurs and for those who seek for a different eating adventure. The owners visit the farms and know the farmers. Sunkist factory provides for the purchase of fruit rinds for the animals, a sweet treat for the animals and a fruity scent for the farm. Game Night is a departure from their focus. Beef is their focus in the restaurant. There are also strong Vegan and Vegetarian options as sides. Vegetarian and vegan options are in the ‘Cow’s Trough’ section of the menu since these are what the cow eats. Co-owner Danielle Brown herself was a vegetarian for 25 years. M’Eat Game Night dinner had two seatings – 5:30 pm and 8:30 pm. The M’Eat event was an exceptional one for Chef Nelson. 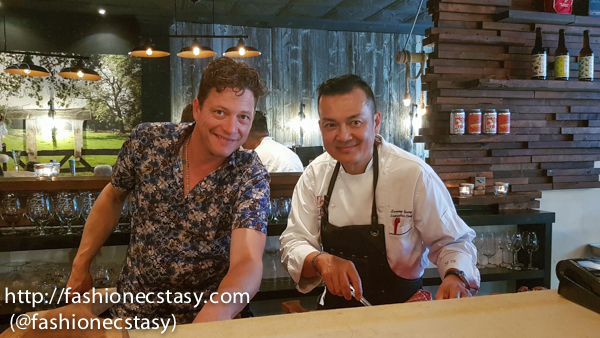 Not only was this an opening event of his new restaurant and butcher but he was honoured to have Chef and cookbook author Sonny Sung to help prepare the meat dishes. Sonny Sung has 13 restaurants in Alberta. Most importantly, Sonny Sung is Chef Nelson’s mentor from 20 years ago in Alberta. Guests for the second seating waited in nature in the beautiful back patio area. One of the Chefs de Cuisine is Rudy Boquila, an experienced chef in many Toronto restaurants. Each meat course was paired with wine from Toronto’s Reine & Pape, and Saki courtesy of Gekkeikan Saki with Canada’s first Sake sommelier Robin Morgan in attendance. All meats creatively presented on a wooden chop board. Also for sale are salts, marinades, sauces, rubs and truffle products to add to the farm to table experience at M’Eat. The setting was natural and cozy. The owners and cooks were friendly, knowledgeable and welcoming. GAME Night at M’Eat Resto Butcher was a meat lovers’ delight. Vegan and Vegetarians enjoyed too.G. It was a fun, beautiful dining evening at a great location.